Thanks to mobile devices, you no longer need a laptop to stay productive on the go -- just the right software to turn your smartphone or tablet into a portable work powerhouse. To assess the quality of each contender, I analyzed how it handles word processing, spreadsheet editing, and presentation management. I took into account the app's interface -- on both the smartphone and tablet form -- as well as the breadth and quality of the features it offers. I also tested several stand-alone apps to find the best Android tablet tool for PDF manipulation, as most office suites don't natively provide that function. 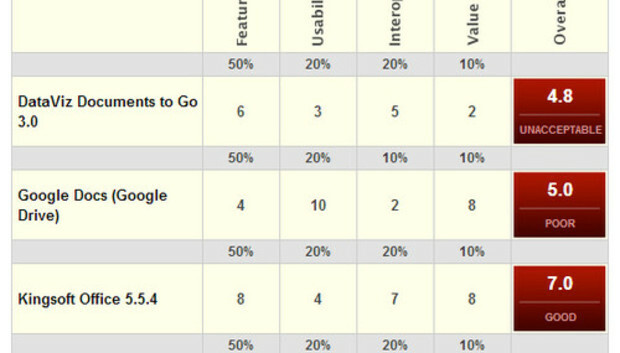 This story, "Scorecard: Best Android office apps," was originally published at InfoWorld.com. Follow the latest developments in mobile technology at InfoWorld.com. For the latest developments in business technology news, follow InfoWorld.com on Twitter.